Home » Mid Century Culture » historic preservation » Early American design – why was it popular in the mid-20th-century? 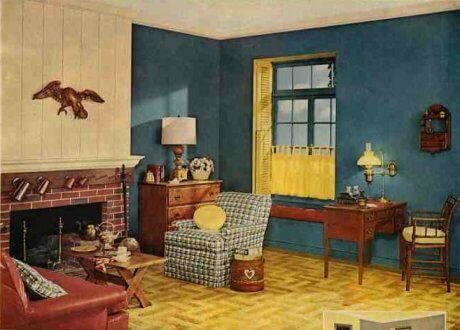 Early American design – why was it popular in the mid-20th-century? 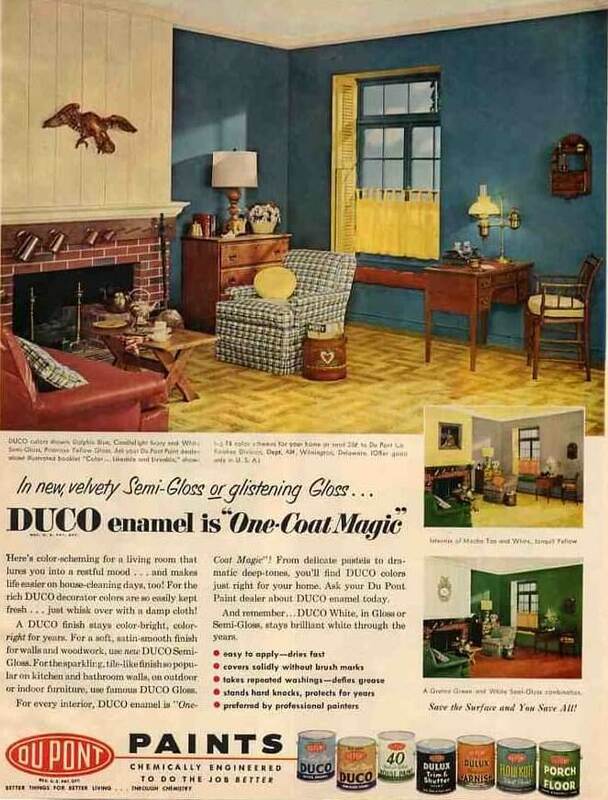 In the early 50s, Duco paint featured advertisements that showcased beautiful interiors – as well as some gorgeous paint colors. This Early American living room is a classic. I love the paneling above the fireplace, and the pegboard for pewter mugs. Also notice the use of a small chest in the living room. Moreover, this image inspired me to do some more research on Early American design, which remained quite popular into the 1950s and even the 60s. I bolded these last couple of sentences because they seem hugely important, and track some of my other research. The importance of the American home apparently really solidified during around this turn of the century period as masses of folks started to rise above hardscrabble. The two concepts – Colonial Revival and the iconic, emotional attachment we as a nation developed to the meaning of “home” in America — converged in this period. Finally, remember my good friend Royal Barry Wills. There is no question in my mind that he gets the credit for keeping the Early American / Colonial Revival style very strong in America in the immediate aftermath of WWII. My vintage postwar magazines are chock full of the stuff. As the 50s wound on, the look began to be usurped by the trickle down effect of high modernism. Although as all articles point out, Colonial style has never stopped being a part of the American landscape. I’d say this is especially true about the exteriors of our homes. The good ole center hall colonial is arguably the #1 most enduring style in America. Relative to our own mainstreet, middle class, mid-century homes today: I say, embrace at least a little bit of colonial decor. Early American is very comfy and homey, to be sure. All the nice wood takes the hard edges off of modernism. And I always like to be a little counter-culture, to laugh in the face of what’s popular today. So be a design rebel! Plop a spindle rocker in the living room, or an early American dining room set proudly in the middle of the dining room, or a great big American eagle over the mantle, and enjoy the history. I am looking for a painting my parents had above their early American sofa. I’m sure it was a print sold at furniture stores. It was ladies on a stagecoach rolling through town with beautiful hats and there were kids chasing it and one boy hanging on the back. If anyone has information on the title or where I could find it I would greatly appreciate it. Hi Jan, I don’t know per se, but will keep my eye out! My late mother-in-law had a copy of the painting that you described. Google “Pemigewassett” and see if that’s it. my mom is looking for the early English couch it has a barn type print she had one in the 1990″s and would like to buy another. Where can we buy one website?